So much has happened since the first blog of The Culinary Cellar. The very best part is all the friends and followers I have made since January 31st, 2010. I love my readers and they have all become my special friends, even though some I have never met but we correspond frequently. You have all made my life richer. 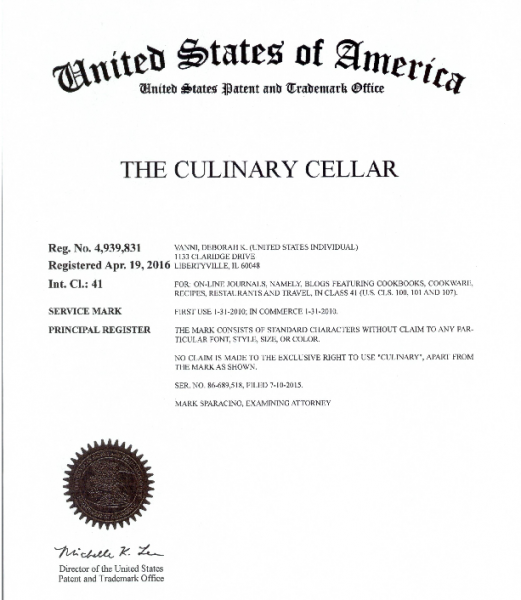 I decided since I loved writing my blog so much, it was time in 2016 to trademark The Culinary Cellar. I was so happy to be trademarked and let everyone who loves cookbooks and recipes know the joy of my cookbook collection. Those who follow me also know the devastation of July 12, 2017 when a flood destroyed almost every single cookbook, recipe, files, and kitchen items of my beloved Culinary Cellar, that took decades to build. But that is definitely not the end of the story because of my friends and faithful readers. For months and months I would open my front door to find hundreds of cookbooks from people all over the country (and some overseas) who wanted to help replenish the collection. People either read about it on the blog or on the Facebook page called “Rebuilding The Culinary Cellar” that some very precious friends started. I received close to 1,000 books and now am on the way to a whole new Culinary Cellar. My heart is full. 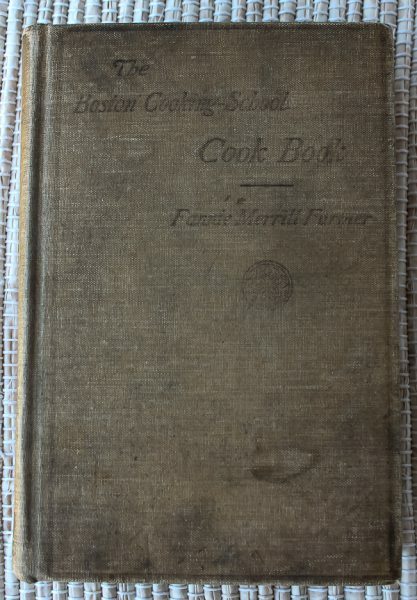 One of the books lost was the first book I ever had in my collection – my grandmother’s 1914 edition of The Boston Cooking School Cookbook by Fannie Merritt Farmer and the subject of my very first blog which also happened to be my grandmother’s birthday. I was heartbroken over its loss. But then something special happened. My daughter Kara found a copy of the 1914 edition online. Not only was this book well-loved by someone but she left me a couple little clippings inside. 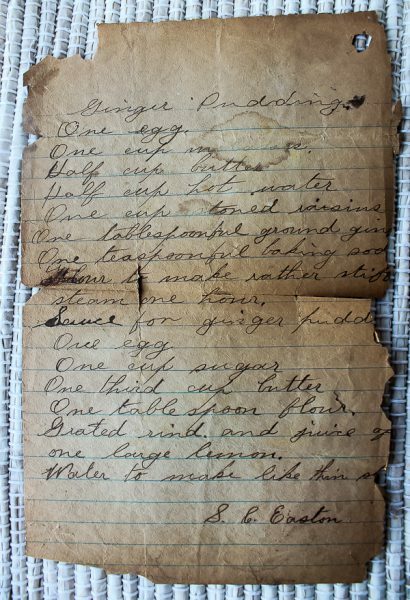 The first is this very old recipe for a steamed Ginger Pudding which I have not made yet but will in the future. Thank you S.C. Easton for this. Also found between the yellowed pages was a grocery list. I was intrigued by the cans of tomato soup until I googled it and learned that the first canned tomato soup to hit the market was 1897, which also happens to be the year my grandmother was born. But that’s not all. When I first opened the cookbook on the second page, I found a very special inscription. 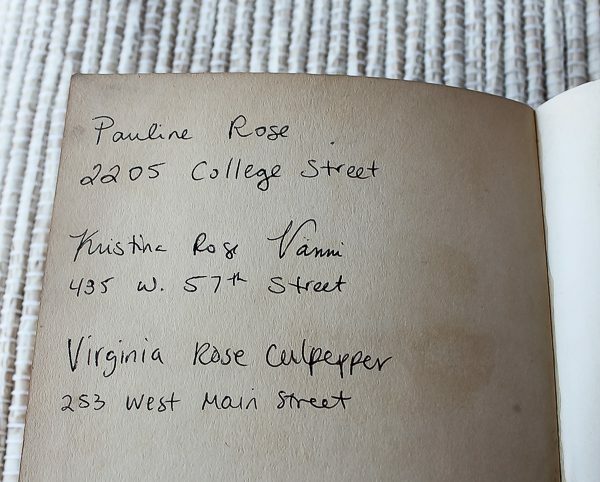 In the original cookbook owned by my grandmother, she had written her name and address where she lived when she attended Iowa State. 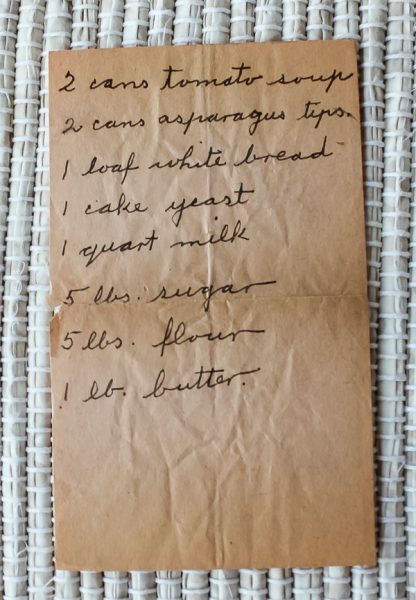 That was one thing I missed, seeing that in my grandmother’s own handwriting. Kara wrote in grandma’s name just as it was written originally, but also daughter Kristina wrote in her name and address because her middle name is Rose, named after her great-grandmother. Kara wrote in her baby daughter’s name, also named after her great-great grandmother. At Virginia Rose’s first birthday party, Kristina and Kara decorated the house with roses, and even included rose water in some cookies and rose-shaped red velvet cakes. Not to mention they all wore clothes with roses on them! Here we are, eight years later, with so many changes to The Culinary Cellar, but it is still alive and kicking! Thank you all my dear friends and readers for making the new Culinary Cellar a reality. And Happy Birthday to our beloved grandmother, Pauline Rose Lamb. You are missed every day. Virginia Rose is One-Year-Old Today! 8 Responses to Happy 8th Birthday to The Culinary Cellar! CONGRATS ! Love reading your blogs–especially the food “staging” photos. Not only have I gotten good recipes to try from your blog, but really enjoy what you write about your family. My interest in cardamom came from you–never knew much about it until you wrote about the best cardamom comes from Finland–and it does ! And if you haven’t tried it yet–put some cardamom in your coffee before you brew it–I use around a teaspoon for every 24 ounces of water. Thanks for being one of my loyal readers, Barb! I love reading your comments. You are so right about the coffee with cardamom – heavenly! Thank you for sharing this latest post and Happy 8th Birthday to you! Happy birthday Culinary Cellar!!!!! May you have many more!!! What wonderful daughters you have Debbie for buying you cookbooks that have special meaning to you. Your granddaughter is absolutely gorgeous!!!!! She looks like a little angel. You are so right about being a grandmother. There is nothing like it in the world. I feel like I am going to burst every time I look at my precious grandson. He turned two on Saturday. I don’t know where the time has gone, every second is so precious. I cherish the time I get to spend with him, soaking in every second. Thank you, Lisa! I am so happy you found my blog, and we can share our love of cookbooks – and grandchildren! Happy Birthday Culinary Cellar Reborn!! So glad that you didn’t give up after the flood but you have rebuilt from the blessing of so many gifted cookbooks with new recipes to try and stories to write. I always enjoy reading your blog with so many heartwarming stories and tasty recipes. Thank you for persevering. All of us are grateful. And I love this story about your daughters finding you the same cookbook of your grandmothers and the rose party. You are all a very special group of ladies. Love to you all and Congratulations! Such kind and loving words, Kim. Thank you, with love and hugs.